The media has a tendency to focus on the negatives of profound disability by giving a hugely disproportionate level of coverage to disabled people who wish to end their lives and very little to the majority who actually value their lives. I try to highlight these good news stories on my blog and have previously drawn attention to the fact that most people with ‘locked-in syndrome’ do not wish to die. 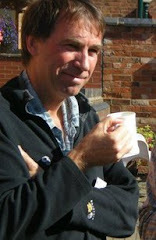 Locked-in syndrome hit the headlines after the experience of Tony Nicklinson. He went to court unsuccessfully to argue that his life had become so intolerable he should have the right to euthanasia and has since died from complications of his condition. I was therefore encouraged to see two more positive stories about locked-in syndrome published over the last month. Richard Marsh recounts his ordeal in the Guardian, explaining that doctors wanted to switch off his life-support after a stroke. He could hear every word but could not tell them he was alive. He is now 95% recovered. The BBC has also posted a video featuring the story of Mike and Wendy Cubiss. Mike had a massive stroke a couple of days after a holiday which left him paralysed and unable to talk. He is able to communicate using his eyes by looking at letters on a board. Wendy has become expert at interpreting her husband’s thoughts. Given a little more time, he can also use a computerised voice system. I cannot find the dialogue from the video reproduced anywhere on the internet so have pasted some of it here. 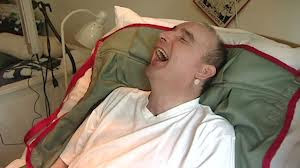 Mike and Wendy have had enormous support from friends, family and carers who come every day but the key to Mike’s determination to live is his keen sense of humour, which is beautifully evident on the video itself (see above). Mike and Wendy want to send a message of hope that life with locked-in syndrome can be fulfilling.